Doldrums gained notoriety in their native Toronto through performances at The House of Everlasting Superjoy, a prominent Toronto DIY showspace they co-ran with members of DDMMYYYY, as well as playing at flash parties in abandoned spaces. 2010 saw them release a number of 7”’s including a split with DDMMYYYY and a VHS video mixtape. Woodhead began Doldrums in 2010 by posting videos and designing websites by fictional bands online under a variety of different band pseudonyms, Doldrums being one of them, taking the name from a favorite children’s book, Norton Juster ’s ‘The Phantom Tollbooth”. The stunning barrage of text and images with the music shows a pointedly critical take of what a ‘band’ is, which fortunately comes across no less digestible than Gorillaz. This year after hearing his interpretation of their song ‘Chase the Tear’, Portishead announced they would release his song as the b-side to their single. At the same time new tracks fell into the hands of cult London indie label No Pain In Pop and were quickly confirmed for release as ‘Empire Sound’, his debut EP. 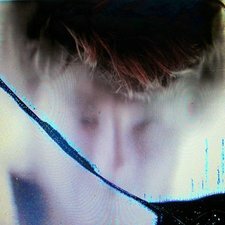 Though now based out of Montreal, Doldrums sound and attitude screams Toronto, where artists like Skrillex, Crystal Castles and Fucked Up are known for challenging existing ideologies about format and genre.